Powers/Abilities: Great mystical powers, poor statesman. History: (Dr. Strange II#71/Dr. Strange III#21/2-22/2 (fb))- 28 "great cycles" (28,000 Earth years) after the reign of Oka'an, the Azure Throne of the Dark Dimension was occupied by the wizard-king Olnar, a descendent (how many times removed is unstated) of G'uran and Oka'an. Olnar foolishly thought of the ancient wars which had almost destroyed his people as "ancient glories" (instead of chaos and misery) and romantically dreamed of conquest. Then, Olnar gave sanctuary to two exiles and fugitives from the Faltine, Dormammu and Umar, who had assumed pleasant humanoid forms. Dormammu and Umar fanned Olnar's dangerous aspirations and showed him how to break down dimensional barriers, invade other realms and absorb them into the Dark Dimension. The revival of such war-like goals made Olnar increasingly unpopular with the Mhuruuks (Wizards) who still formed the ruling class of the Dark Dimension. Eventually, the wily Faltinians "helped" Olnar annex the neighboring dimension of the ever-hostile Mindless Ones (creations of Plokta), and Olnar was killed in the ensuing struggle, as had been Dormammu and Umar's purpose all along. After Olnar's death, the Faltinians used the Mindless Ones invasion as an excuse to seize power, killed all the Mhuruuks who opposed them, and exiled the few who survived to the fringes of the Dark Dimension where they became known as Outcasts. Comments: Created by Roger Stern and Paul Smith. Powers/Abilities: Great mystical powers, natural charisma, empire builder and conqueror. History: (Dr. 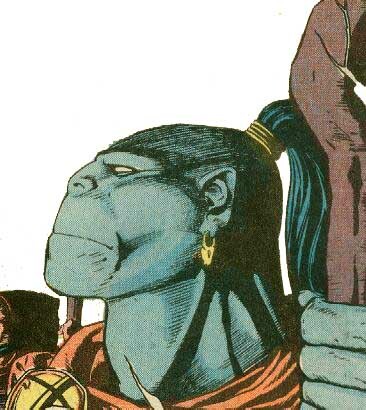 Strange III#21/2)- After many centuries (or "cycles") of strife between various clans of Mhuruuks (Wizards) in the Dark Dimension, there arose a Napoleon-like figure, G'uran, later known as G'uran the Great, who led his clan to conquer all other rival clans. G'uran founded the G'uranthic Empire and the Azure Throne, which became its seat of power. He also created its awesome protector, the G'urantic Guardian, and the G'uranthic Gemstone. G'uran, however, was not able during his lifetime to unify the Dark Dimension under one rule; that privilege would fall to his descendent, Oka'an. Created by Jean-Marc Lofficier, Roy Thomas, Lee Weeks and Doug Hazlewood. Powers/Abilities: Great mystical powers, natural charisma, peace-maker and statesman. History: (Dr. Strange III#21/2)- After G'uran founded the G'uranthic Empire and embarked upon the conquest of the Dark Dimension, many more cycles of strife followed between rival clans of Mhuruuks. 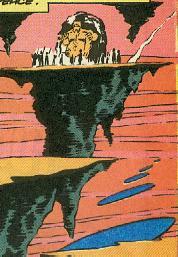 It fell to G'uran's descendent, Oka'an, to finally make peace and unify all of the Dark Dimension under one rule, his. The ever-present menace of the Mindless Ones and the risk of forever losing the previous light because of endless warfare were undoubtedly factors which helped Oka'an make his case. Oka'an's rule was later seen as the beginning of a Golden Age for the Dark Dimension, which lasted for approximately 28,000 Earth years. Comments: Created by Jean-Marc Lofficier, Roy Thomas, Lee Weeks and Doug Hazlewood. We do not know how many years elapsed between the reins of G'uran and Oka'an, but it is clear that the latter is not the son, but a "descendent" (how many times removed is unrevealed) of the former. Dr. Strange II#71, page 1, panel 3.